Many years ago some friends invited me to a concert that they assured me would be spectacular. Since I was familiar with their taste in music, I enthusiastically agreed to go with them. To this day, I’m glad I did, because something happened that night that changed the trajectory of my life irrevocably. The musicians were from India and the concert was held in a small, intimate venue. The violinist came out on stage early with his instrument and a plastic grocery bag. He sat down cross-legged on the stage, deliberately took out a thermos and poured himself a cup of tea which he began sipping while he tuned his violin. Every move was unhurried. During the concert, I was completely absorbed. These musicians were the best of the best; they played for 3 1/2 hours with just a short intermission. Long concerts usually reach a point where the audience has had enough, but not this time. I was stunned by the connection between the players, and noticed that even during the many technically difficult passages, they didn’t seem taxed at all; rather, they had looks of total bliss on their faces. At this time in my training, I was suffering from severe stage fright, so it was a revelation to me that this level of performance was even possible. Simultaneously, my health had been deteriorating into chronic fatigue, which ultimately went on for nearly a decade. One day, a friend invited me to a yoga class which became a standing weekly event, and as I practiced, I gradually began to feel better. A few months later, I began studying flamenco and I knew I was on the mend. I felt as though I was beginning to come back to life. I could sleep 10 hours each night feel rested. My first waking thought every single morning was, ‘When will I practice?’ But within a short time I ended up with a severe playing injury that sidelined me for a full excruciating year. When my physio found out I did Yoga, she told me that if I ever stopped, my playing career would be over. Her words gave me a nudge in that dark time, and I began dedicating myself to daily Yoga practice in the same way I had previously dedicated myself to flamenco study. Slowly, I got better, and eventually returned to studying flamenco at every opportunity. Yet, something had changed within me. The concert I attended several years before was still operating on me and doing its work. My flamenco teacher was furious when I decided to take a Yoga teacher training program. I assured him that my goal was not to stop playing guitar, but to enlist my Yoga practice to help me do it even better. After all, many Indian musicians sequester themselves in the temple and meditate and play for hours on end. Music is a spiritual practice for them, and I wanted more of that quality in my own playing. The training program was long (600 hours over 2 years), but gratifying. When it was over, I found myself writing music. Then, in 2012, I finished a substantial course on Ayurveda, the sister science to Yoga. It’s a comprehensive, individualized lifestyle system that prepares and supports the body for spiritual development. Not long ago, I realized that I had only recovered about 80% of the energy I used to have before I developed chronic fatigue and that I still often felt lethargic. I wanted to do bigger things, but I needed ALL the energy available to me, so I set an intention to attain that. I used the principles I had learned and applied them fully to my own situation. I turned 50 this year, and honestly, I’m in better physical, mental and emotional shape than when I was 20. I feel great! This combination of Yoga, Ayurveda and Flamenco is essential for me. They’re the perfect balance and foil for one another: Flamenco is a passionate, raw, energizing, up until 4 am, leave-everything-you’ve-got-on-stage kind of thing. As a creative powerhouse, I NEED to spend my energy on something this intense. Yogis would rather wake up at 4 am, but because of my practice, now I can hang out with the Yogis and the Flamencos (fortunately, that doesn’t usually happen at the same time!). Physical Yoga helps me work the kinks out of my body so that I can keep playing. Meditation helps me concentrate connect with my intuition. Ayurveda has taught me the diet and lifestyle support that Living Large requires. I consider myself to be very much like a professional athlete. I put thought and care into every aspect of my life in order to excel, from what I eat to how I exercise to how I bring myself down at the end of the day so I can sleep well. Far from being austere, these simple practices allow my life to feel full of rich experiences. Curious about my work? 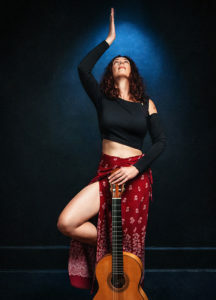 Check out my new fledgling website for Bite-Sized Lifestyle for Yoga & Ayurveda, or go HERE to learn more about my work as a flamenco guitarist.